This new portrait of the Andromeda Galaxy, or M31, was taken with the Subaru Telescope's new high-resolution imaging camera, the Hyper-Suprime Cam (HSC). A new portrait of the Milky Way's neighbor, Andromeda, shows our twin galaxy in a whole new light thanks to a new instrument on Japan's Subaru telescope at the summit of Hawaii's Mauna Kea. The instrument, called the Hyper-Suprime Cam (HSC), provides sharp images of the cosmos across a wide field of view. 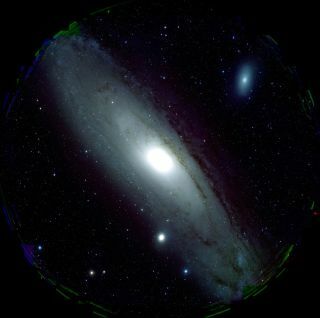 The new photo demonstrates that the HSC camera makes good on its promise of offering his-resolution views of objects throughout the telescope's large 1.5-degree field of view. "This first image from HSC is truly exciting," Masahiro Takada, chair of the HSC science working group at the Kavli Institute for the Physics and Mathematics of the Universe in Japan, said in a statement. "We can now start the long-awaited, largest-ever galaxy survey for understanding the evolutionary history and fate of the expanding universe." Astronomers plan to use the HSC to take a cosmic census of every galaxy across a wide swath of sky, probing in depth to peer back through the cosmic eons. The census will record galaxy shapes for a study on how massive objects bend light through their gravitational pull in a process called gravitational lensing. "Such data will allow scientists to map the distribution of dark matter, constrain the nature of dark energy, and search for baby galaxies that were just born in the early universe,” Takada said. By analyzing galaxies that are gravitationally lensed, astronomers can study how much matter is in the universe, and better understand its invisible component, dark matter. They also hope to probe the strange entity, called dark energy, that is causing the expansion of space to accelerate. "The sharp resolution in the current image augurs the instrument’s capabilities for capturing weak lensing, which is central to HSC's scientific goals of surveying the parameters and properties of dark matter and dark energy in the universe as well as exploring the causes of the accelerating expansion of the universe," Satoshi Miyazaki, director of the HSC project, said in a statement.